Superman, you have not see the moons of Krypton any more than I have. In fact, because you haven't read/watched roughly 71,000 versions of your origin story, I would say less. This is just such a poser thing to say. And he says stuff like this all the time. It's like some dude who lived in Japan for 6 months and comes back and corrects sushi waitresses all over town. 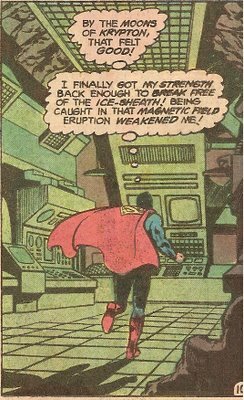 If I were hanging out with Superman and he said this, I would be rolling my eyes.